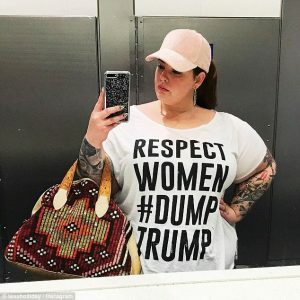 From Daily Mail: Tess Holliday is using her platform as a model to speak out against Donald Trump and the allegations of sexual assault against him. ‘Respect Women,’ she captioned the image. ‘Our bodies are not for you to stare at or touch without our consent. Women are not just sexual objects, women are not here for your consumption. So many of us have a sexual assault story, myself included,’ she continued. The photo, which was taken by her longtime partner Nick Holliday, sees Tess posed with her hands on her hips as she stares at the camera. Along with the white T-shirt, which features black block lettering, she is wearing ripped jeans and black high-heeled sandals. The photo has been liked more than 62,000 times since it was posted on Saturday, and unsurprisingly, the political statement caused a stir. There was also a fierce debate about whether or not Tess’ post could be seen as an endorsement for the Democratic nominee, Hillary Clinton, and some people who disagreed with her statement attacked the size 22 model for her weight. ‘There is some super hateful stuff on here,’ one woman wrote. ‘I don’t agree or disagree with your position, but I still admire your message. Why can’t everyone get along! Dang! Everyone gets to have their own opinion people! Read about the rest of this womyn’s rant here. This entry was posted in Donald Trump, Liberals/Democrats/Left, Media, Trump Derangement Syndrome, US Presidents and tagged Instagram, New York city, Obesity. Bookmark the permalink.